Percival Waddams Petter was born in Yeovil on 26 May 1873, the son of James Bazeley Petter and Charlotte Waddams née Branscombe. Percival, known as Percy, was the twin brother of Ernest Petter. His father was a successful ironmonger with a shop in the Borough, over which the family lived, as well as an ironfounder with a foundry in Hendford. Both James and Charlotte had been raised in the Exclusive Brethren, but broke with them in 1883, after which they attended the local Anglican church. Percy, however, maintained an ambiguous commitment to Brethrenism despite an allegiance to the Church of England and in later life he wrote many religious booklets and leaflets. In the 1881 census James and Charlotte were living above the ironmongery shop in the Borough. By this time they had nine of their children living with them. James listed his occupation as Ironmonger (Master) and the four eldest boys were all ironmongers' apprentices - James JB aged 19, twins Ernest and Percival aged 17 and Hugh aged 16. The remaining children were all listed as scholars. Also living in was another apprentice as well as a cook, housemaid and nurse. The twins were educated first in Sherborne, then at Yeovil Grammar School and finally at the age of fourteen both boys were sent to Mount Radford School in Exeter. 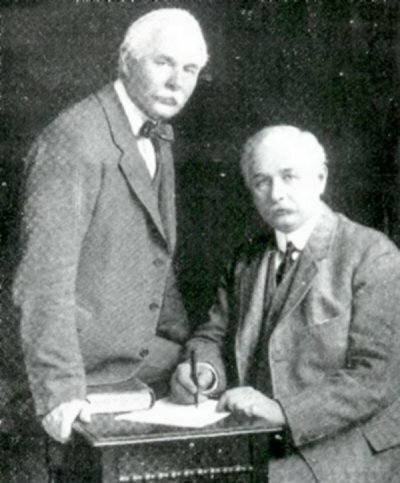 In 1890 both Ernest and Percy left school to start their apprenticeship in their father's ironmongery and foundry business. While Percy entered the foundry to learn that side of the business, Ernest's abilities were inclined towards finance and accounting. By 1892 the brothers had designed and produced a self-propelled oil engine and in 1895 they developed a new engine of one horse-power designed specifically to propel a 'horseless carriage'. 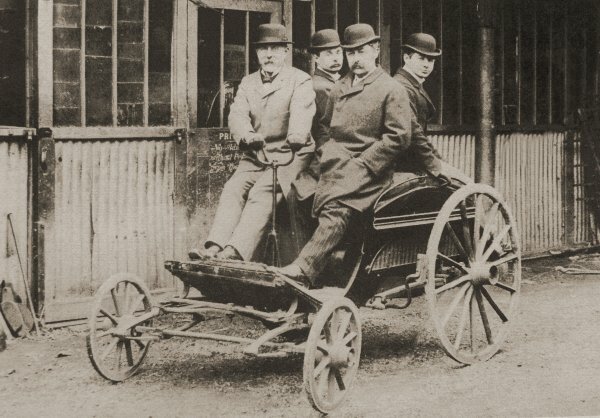 They, together with their inventive Engineer and designer Ben Jacobs, produced the first motor car with an internal combustion engine to be made in the United Kingdom, using a converted Hill and Boll four wheel horse-drawn phaeton and a 3hp Petter horizontal oil engine. The vehicle was constructed at the Park Road carriage works of Hill and Boll. It weighed 9cwt (457kg), including the 120lb (54kg) of the Petter engine with its flywheel and side bars, and had a top speed of 12 miles per hour. This same year James made Percy the manager of the foundry. In the late 1890's the Petters established the Yeovil Motor Car Co Ltd with the intent of manufacturing automobiles. Initially the company produced a small motor carriage for two but eventually twelve different models were designed and produced although sales did not meet the anticipated targets. In 1897 the Petters entered the 'Yeovil Car' for trials at Chelsea organised by the Engineer magazine with a thousand guinea prize. However they failed to win the prize and also failed to achieve the commercial success they had hoped for with automobiles and consequently adapted their engines for agricultural and industrial use. In the 1901 census Percy was aged 27 and listed his occupation as an iron founder. He was still living with his parents and some of his siblings above the shop in the Borough. In 1901 Ernest and Percy bought the business from their father following which they reorganised and renamed it as James B Petter & Sons with both the sons as joint managing directors. At this time their father, James, retired from business. Ernest and Percy concentrated their efforts in designing and building stationary and marine oil engines but while Percy remained in the Yeovil foundry Ernest moved to London to open a company office there. In 1904 Percy married Emily Kennan of Dublin, a daughter of one of Petter's sales agents, they were to have two sons and four daughters. In 1915 he became Managing Director of Petters Ltd which had been known as J B Petter & Sons until it was registered as a public company in 1910. Percy was the President of the Yeovil Men's Adult School which was advertised in Collins' Directory of 1907. During the First World War the brothers set up Westland Ltd to produce military aircraft, which they continued to do after the war. After the First World War, in 1919, Percy became one of the 'Pilgrim Preachers', who preached on a journey between Bath and London. It was also around this time that he entered local politics and served as mayor of Yeovil between 1925 and 1927. The Petter company obtained a patent on calculator technology in 1923 and two more in 1930. Percy's brother, Guy Bazeley Petter, then took out equivalent US patents. 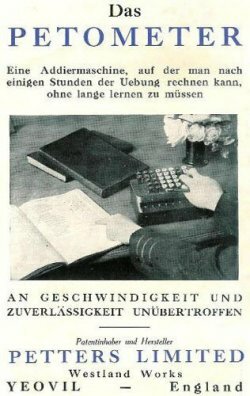 In 1931 Percy designed and produced a mechanical desk calculating machine, called the Petometer (illustrated at left in a German advert of 1931) although this only sold in small numbers. The company subsequently sold its calculator designs to the Bell Punch company. In 1938 he retired, resigning as vice-chairman of Petters Ltd on the sale of the company to Brush Electrical Engineering. His wife Emily died in 1935 and a second marriage, to Ruth Penson-Harris, followed in the winter of 1945. Percy Petter died in 1955 at Christchurch, Hampshire. James Bazeley Petter (steering) sitting next to Herbert Southcombe, with twin sons Percy (left) and Ernest (right) in the rear seat, on one of their automobiles in a photograph of about 1897. Percy Petter later wrote in his memoirs "In those days the law required that every mechanically propelled vehicle should be proceeded by a man walking with a red flag, and, as the horses were quite unaccustomed to 'Horseless Carriages,' they usually took fright when they saw one coming, and this gave us a lot of trouble." The Petter twins - Ernest at left and Percy at right - probably taken in the early 1950's.